I was feeling a little under the weather a few weekends ago but wasn't in the mood for takeout. It was a lazy Sunday so I was craving something comforting and homemade...and carbs, I needed carbs. As is often the case at this time of year, there was a healthy supply of tomatoes, basil, and garlic sitting on the counter. The goal was for the meal to be quick and easy so I grabbed Marcella Hazan's Essentials of Classic Italian Cooking and Cook's Illustrated's Italian Classics and ended up mashing together their respective recipes for Aglio e Olio (Pasta with Garlic and Oil). To up the gluten factor, I pulled some of my homemade sourdough out of the freezer and used a tweaked version of The Food Lab's Best Garlic Bread as a side. Comfort overload. This Italian classic has the perfect balance of flavors. 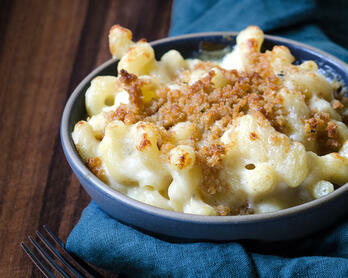 The garlic doesn't try to be a diva and the acidity and sweetness of the tomatoes fill in all the nooks and crannies. A huge bonus is that Aglio e Olio is straightforward and comes together quickly. On that note, mis en place is helpful when whipping together this weeknight-friendly meal. It's easy to overcook the pasta or burn the garlic if you're prepping ingredients. I've always been a fan of my Rosle garlic press and, until recently, relied on it whenever a recipe called for minced garlic. During one of my Google benders, I came across an article on Serious Eats entitled The Best Way to Mince Garlic. The gist is that mincing garlic with a knife breaks down the cells of the clove less than pushing it through a press or running the clove along a microplane grater. The more you break down garlic, the more spicey and aggressive the flavor. Without even tasting them side by side I can understand the logic. Pressed garlic is a blend of mush and liquid whereas minced garlic is just little pieces with most of the liquid still safely inside. I've made Aglio e Olio in the past with pressed garlic and always found the flavor to be quite strong but not so strong that I didn't want to eat it. I have turned down very few bowls of pasta in my day. For this version, I minced the garlic with a knife. Yep, much more balanced. For recipes such as homemade mayonnaise, I use grated or pressed garlic because I want a tiny bit to permeate the mixture. 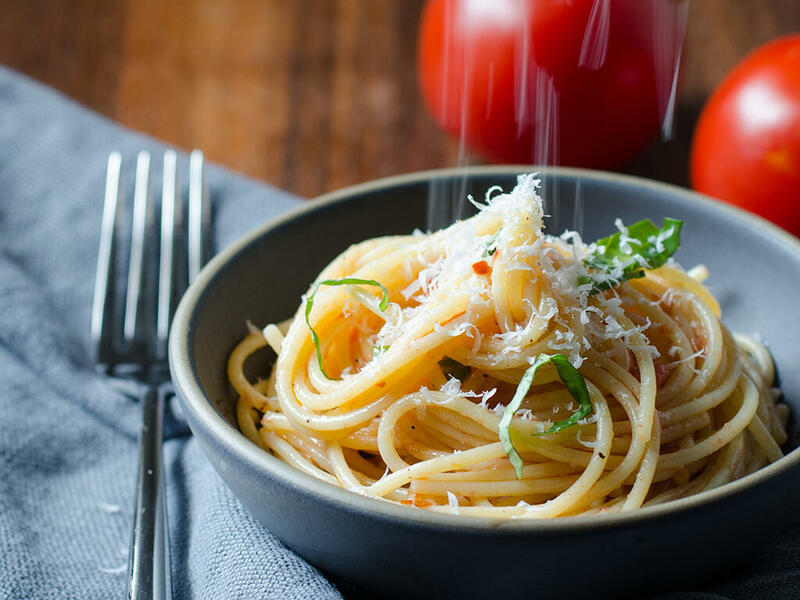 For Pasta with Garlic and Oil, the sweeter and milder flavor of the minced method is preferred. The garlic bits gently infuse the oil and add just the right amount of punch without making you feel like you're breathing fire. Start with cold water in the pot. Apparently, hot water can contain more dissolved impurities from the pipes and potentially from the water heater. What?? Up until this week, I thought I was "saving energy" by using hot water when bringing a pot or kettle to a boil. Not true. A New York Times article on the subject of water temperature discusses how the E.P.A. says to use only cold water for cooking, drinking, and preparing baby formula. I feel like everyone knows this and I'm late to the party per usual. While reading about water temperature, I came across the Mpemba Effect which suggests that boiled water freezes faster than cold water. Turns out boiling water is more complicated than previously thought. Studies suggest that al dente pasta has a lower glycemic index than fully cooked pasta. Al dente is always the preferred texture and now there's a health benefit, too. As many Italian chefs have said, salt the pasta water so that it tastes like the sea. Cooking pasta in salted water is the only way to add proper flavor to the noodles. Do not rinse the cooked pasta. Just don't do it. Nike was wrong. The starches are critical for sauce development and the sauce's ability to cling to the noodles. Speaking of Nike, did you know that their famous tagline was "inspired" by the last words of a murderer? That seems like a nice note to end this section on. Cook's Illustrated's Italian Classics suggests 2 tablespoons (6 teaspoons) of minced garlic for 8 ounces of pasta. Marcella Hazan's recipe call for 1 teaspoon. That is quite the discrepency. I started with 1 teaspoon and ended up with 3 teaspoons (1 tablespoon) but would still have enjoyed the dish with 2 teaspoons. Chef's discretion when it comes to tweaking this amount. I really enjoy how a touch of lemon can brighten a dish. This ingredient was lifted from the CI recipe. Both Cook's Illustrated and Marcella Hazan suggest parsley but I went with basil. 8 ounces Early Girl tomatoes Note: If you can't find Early Girls, just go with whatever tastes great. You should end up with about 4 ounces after prep. 2 teaspoons minced garlic Note: See "To Press or Not to Press" above. 1/8 teaspoon red pepper flakes, to taste Note: I have added up to a 1/2 teaspoon and enjoyed the extra heat. If you want a softer flavor, stick with 1/4 teaspoon. Freshly grated Parmigiano-Reggiano, to taste (optional) Note: A number of message boards suggest that cheese is forbidden in this dish because it's not traditional and/or ruins the olive oil flavor. Meh, I like it both ways. Try a couple bites of the pasta with and without the cheese and decide for yourself. This dish comes together quickly so I recommend having all of your ingredients prepped and ready to go before cooking the pasta. Peel the tomatoes with a vegetable peeler, quarter, scoop out the seeds, then chop fine. You should end up with about 4 ounces. In a bowl large enough to toss the pasta, add the tomatoes and a 2-finger pinch of flake-style salt. Gently toss to distribute then set aside. Add olive oil, 1 teaspoon of minced garlic, and the red pepper flakes to a medium non-stick pan and heat over medium-low to low, swirling frequently. Once the garlic is straw color, move off the heat, then add the lemon juice and remaining 1 teaspoon of garlic. Note: You want to simmer the oil low and slow - it should look effervescent. The garlic can become bitter if it cooks to the point that it's brown. Meanwhile, bring a large pot of water to a boil, generously season the water with flake-style salt, and cook the spaghettini per the instructions for al dente. If the garlic oil finished before the pasta, put it back over a medium to medium-low flame and reheat before the pasta is done. When the pasta is al dente, transfer it directly to the pan with the garlic oil, add 1 tablespoon of pasta water, and briskly toss the pasta and oil over medium heat until the sauce coats the noodles (about 1 - 2 minutes). Note: During the transfer, it's ok if a little liquid comes over with the pasta as it helps bring the sauce together. Scrape all of the contents into the bowl with the tomatoes, add the basil, then toss thoroughly. Salt and pepper to taste. Add freshly grated Parmigiano-Reggiano, to taste (optional). Serve immediately. You don't want super sweet cherry tomatoes with this. The tomatoes I had from Maggie's Farm were a good balance of acidity and sweetness so they complimented rather than competed with the garlic. 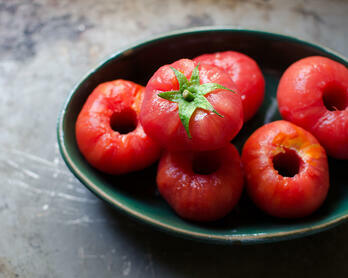 Cut the cherry tomatoes in half then salt and set them aside per the instructions above. 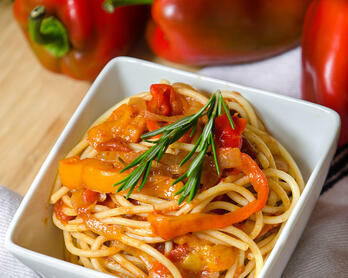 Add the cherry tomatoes and any juices to the oil when you add the pasta to the boiling water.